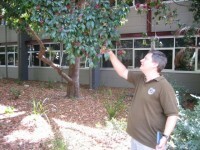 My mate Discopig and I have been talking for a while about picking some lillypillies (also known as riberries) from the trees around our workplace on campus at the University of Wollongong. We noticed this week that the lillypilly right outside our back door is dripping with fruit, so we thought it was time for some action. 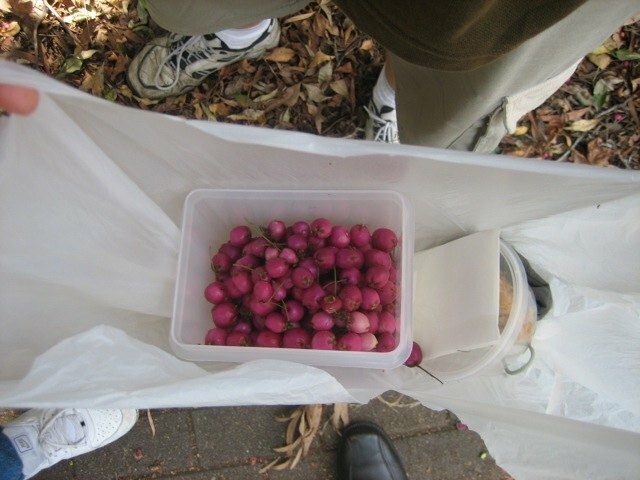 We took a container out at lunchtime and started picking the berries. It was an interesting experience. Most people that walked past looked to see what we were doing, and a few stopped to ask. We showed them the berries and some had a taste, but most thought we were just strange. One guy stopped for a while and chatted to us about indigenous food plants – his wife likes lillypilly jam, and he has some Davidson’s plum trees growing in his yard. At one point a University security guard was walking down the path towards us. I thought he was going to say something, but then he turned and walked off down a side path. I think the sight of two guys dressed in office clothes standing in a garden bed picking lillypillies from a tree was more than he wanted to deal with. I’m sure we looked like we were doing the wrong thing, but then it probably isn’t against any rules and we weren’t doing any harm – he probably just didn’t want to waste his time with us and would rather pretend not to have noticed. Fine with us! We probably got a bit over a kilo of riberries, and you wouldn’t even know there were any missing. According to the CSIRO page on riberries that would be worth about $30. There would be dozens of kilos of berries on that one tree alone! 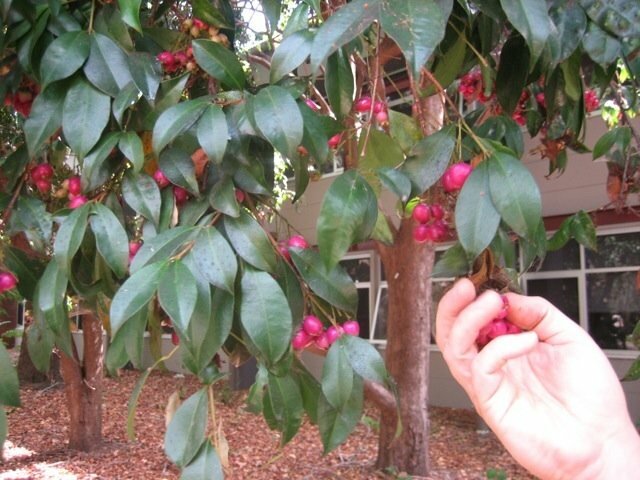 The small leaved lillypilly tree (Syzygium luehmannii) is a medium-sized coastal rainforest tree. They normally fruit between December and February, but you often see them fruiting outside of that period depending on the local microclimate. The red berries are called riberries, and are about the size of a small grape with a single seed inside. They taste a little bit like a tart apple, with a hint of clove. Lillypilly trees are really common all along the eastern seaboard of Australia as street trees, in public parks, and in front yards. They’re an attractive plant, grow quickly, provide a good screen, and need no looking after. Here’s what I did with the riberries. Nice one Darren and Danny! At the Grove, we have managed to collect enough feral guavas to make three pies and one crumble (see the post http://maculatagrove.blogspot.com/2009/03/feral-guavas.html). We almost have enough for another pie or crumble. Getting free food which would otherwise be wasted simply rocks! Vanessa also noticed that some of our juvenile lillypillies have small amounts of fruit on them. So we should be able to get a harvest in the next couple of years. @Jason: I had read your guava post. We planted some guava trees in the front yard, and feijoas out the back (which are similar, I believe). Lillypillies are actually pretty good, and are overlooked by most Australians – even those with them growing in their yard. I’m going to pick some more soon for lillypilly jam. Just a heads up that I’ve linked to your Australian rebates page from my most recent post. Hope that’s ok.
Riberries? I never heard of it before, Darren. Would you mind to tell me, what’s the benefit of eating this kind of berries? Can the diabetics eat it without any hesitation? @Wilson: It seems from your web site that you’re in the US? 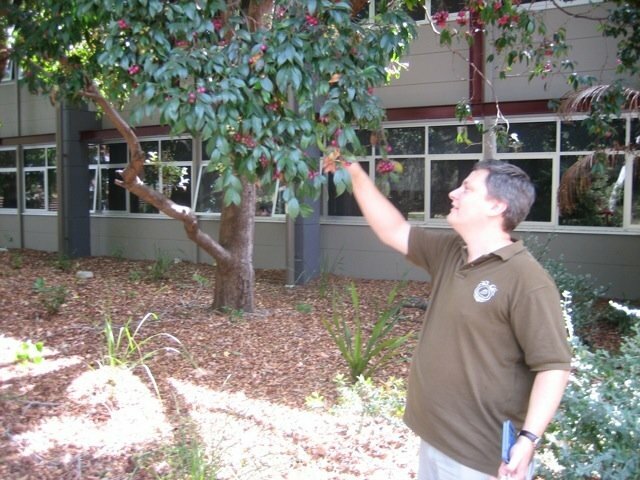 Lillypillies are an Australian native tree, so you probably won’t see riberries over there. The benefit of eating them is that they’re yummy! And free! I’m not sure about diabetics. What a cool blog. It’s set up so well and the stories are fun to read. I’m visiting from Problogger and think that an experiment in suburban household sustainability makes a wonderful tagline that lets me know what to expect. @Beth: Thanks! I’m hoping (actually, I know!) this Problogger 31-day exercise is going to get this site to the next level. I’m a computer engineer, so I think I’m going to be enjoying your blog too :-). Hi, very nice blog! I like your story! And yesterday I picked lots of Lilly pilly! Wanna make jam or wine, then I found your blog! Great! Thanks! @Sophie: Thanks! Let me know how you go with the lillipillies. I think the idea of lillipilly wine has merit!